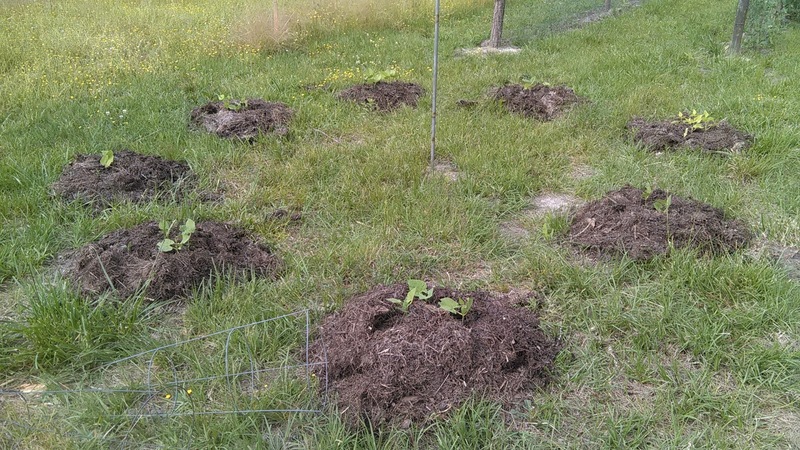 The garden is growing fast, and Adam is quickly applying mulch to the beds to keep down weeds. The sweet peas are going gang-busters! The sugar snap peas are out-performing the English peas, but only the harvest will tell which is better. 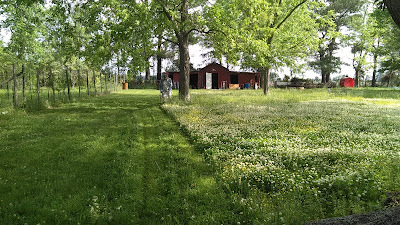 Yesterday Adam mowed to get the pasture under some semblance of control. We have a church picnic here this weekend. I now have 65 tomato plants in the ground. Quite a few are cherry tomatoes. So far, from the look of the plants, Black Prince and Green Grape don't seem very healthy. Green Grape plants appear to be recovering a bit. 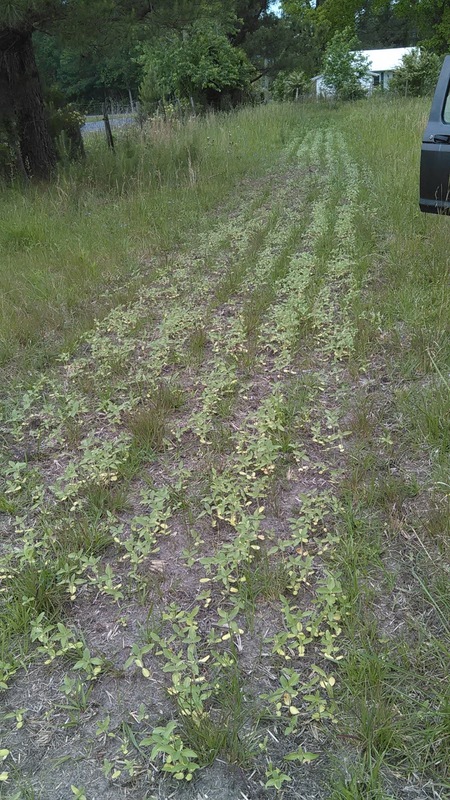 Black from Tula plants, although germinating early and seeming hearty, are yellowing and spindly in the ground. Sweetie tomatoes yellow significantly on bottom branches. The Large Red Cherry plants started quite well but spotted in the greenhouse while I was away. Not sure why. I potted them up larger and am hoping they recover. Cherry Chocolate, Juliet (a grocery store pack, I'm sorry to say), Black Cherry, both of Mr. McFadden's plants he gave us from church, and Matt's Wild Cherry. Come to think of it, the cherry varieties are doing quite well, have more foliage, and are green and healthy with few spots or yellowing. The first bed is sicklier, and the second bed is better-looking. 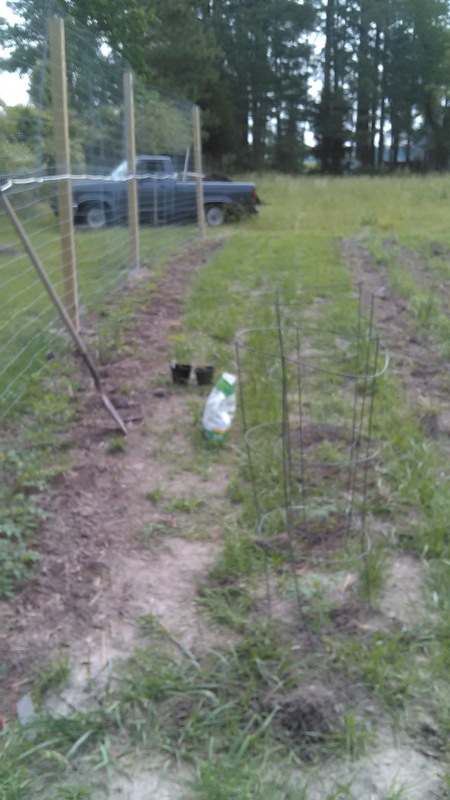 And today I began another row of tomatoes because I have so many in the greenhouse still. These will be in cages, which we found on the farm. Second tomato bed on the left against the trellis. Beginning of cages on the right. Adam brought a truck load of mulch/compost over for the tomatoes. Beans are growing beautifully. Most of these were started in the greenhouse and transferred outside. Adam planted corn and it is up! Can you see it? 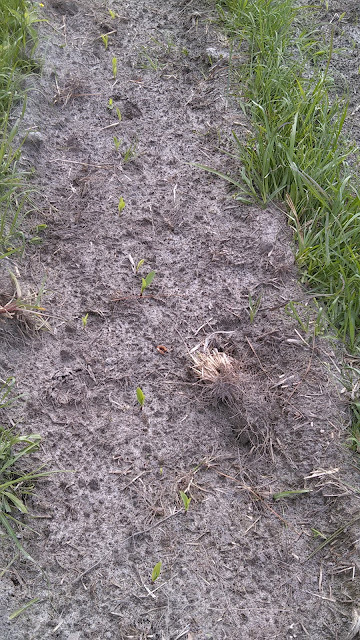 He has eight rows of corn: 3 silver queen, 3 popcorn, 2 ornamental. He's planting pinto beans among his corn. He finished up that field this morning. 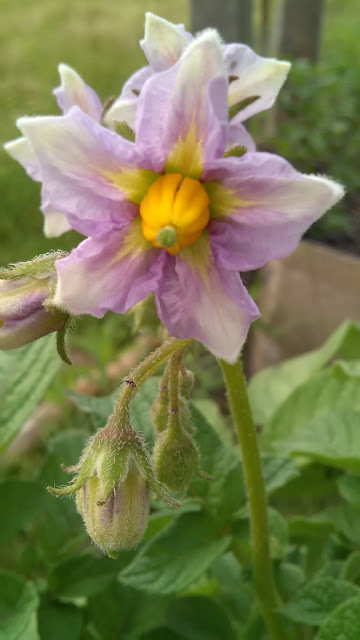 The potatoes are blooming and they do have such pretty flowers. I've put 2 zucchini hills, 3 cantaloupe hills, 2 watermelon hills, 2 cucumber hills plus 5 other plants, and about 6 squash plants. I have more cucs in the greenhouse waiting for some hills that are presently occupied by fire ants. Adam's taking care of that. The broccoli hasn't flowered yet. The lettuce and greens are beautiful; we'll have salad tonight, with some sugar snap peas. The kale bolted quickly, but the collards are looking lovely. Adam bought two packets of pumpkin seeds because he knew it would make me happy. I've started them in cells and will transplant them into hills somewhere when they're bigger. The sunflowers along the road are looking great! Hundreds of sunflower heads, waving at passersby. And hopefully a good start on chicken feed for next year. The first seeding Adam put down was eaten by birds b/c he didn't bury it well, but this second seeding is doing fine. *wheat/barley field -- the verdict is still out, but we're wondering what exactly is in that field and whether any of it is wheat or barley! 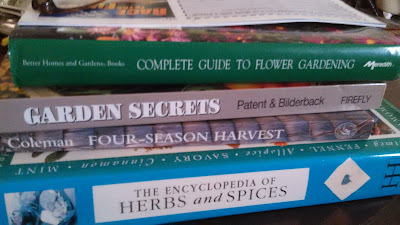 *greens/lettuce -- the ones we have are lovely, but we didn't get the germination we'd hoped. Perhaps more nitrogen needed? *beans -- trying to start them too early, too cold. Peas like it cold; beans like it quite warm. *the greenhouse -- what an inexpensive, wonderful asset! *compost -- Adam's compost-making skills are supreme. It's been a blessing to our early growing. *germinating seeds -- generally, I was quite successful in this task. Wish I'd had a bit less success with the tomatoes because now I can't bear to throw them away. *good beds -- Adam does a great job prepping a garden bed. *herbs -- Not that I started them myself from seed, but the herb bed is looking good. What will I write in August? Will we eat from our land? Will we sell any tomatoes? Get lots of canning done? Oh, I hope so! Your farm is certainly under way. I look forward to seeing your crops as they grow, flower and give produce. 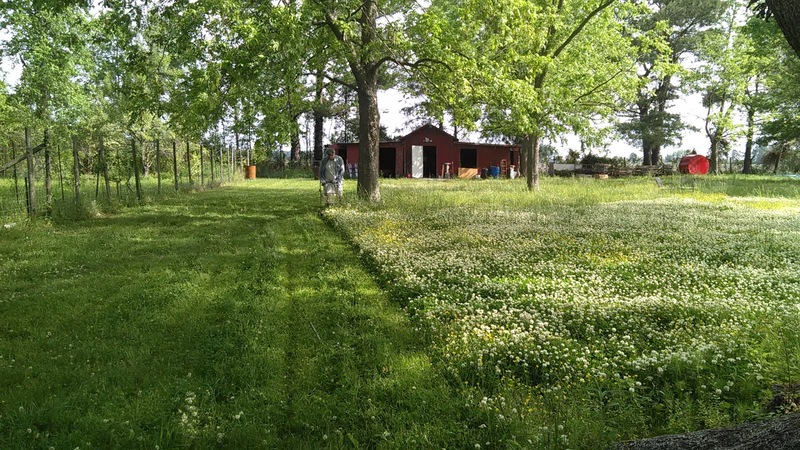 That mowed field is beautiful! A perfect place for a church picnic. Your plants look like they are doing well. I think you'll have tomatoes coming out your ears by the sounds of it! I like your reading stack. I think you will definitely have enough tomatoes to sell some. I expect surplus of anything can go back into the compost. It makes me feel less sad about things finishing when I know they can still be useful as compost. That potato blossom is gorgeous! You guys have your work cut out for you keeping up with all of that bounty! It looks like I'll have to drag my containers into the house this weekend. It's going to get COLD. I figured that might happen. It's Minnesota, after all! Keep up the good work! So glad I popped over from Pom Pom's to read your post. Love all the farm news. We are weeks behind you! The best thing is that you mentioned starting ginger. Until I read that, I had forgotten that I had a ginger root tucked away that was developing shoots/roots. Need to get that in a pot and into the sunshine! Wish me luck! Wow, you are doing so well! SOOoo many plants!! What is a gourd? Is that like a Squash?